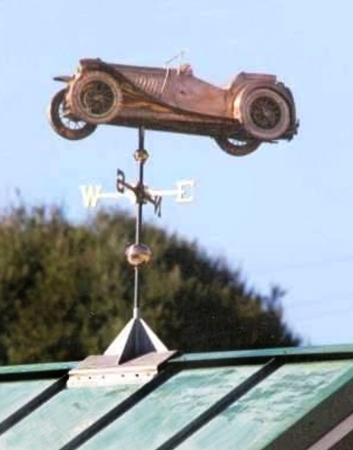 The fully 3-D MG Weather Vane Sports Car shown here was made for a customer in the Monterey Bay Area of California. It was made in the large size (3-foot sculpture piece) and mounted on top of a barn storing the customer’s collection of antique cars. Per the customer’s preference, it was crafted in copper with brass accents. Other choices include nickel silver and optional palladium and gold leafing for a more vibrant contrast in color. Most of the weathervanes we make here at West Coast Weather Vanes are swell-bodied, rather than fully 3D, meaning that while they also have dimension, their two separate sides are intentionally kept narrow for increased aerodynamics. Three-dimensional weathervanes are spectacular but they require greater internal structural support as they are wider, and therefore more wind resistant, than their sleeker swell-bodied counterparts. They also require greater internal structural support and take considerably longer to make. We are often able to reduce the design fee for some of our more mechanical weathervane commissions if detailed schematic drawings are available. Also helpful, are detailed photos of the actual vehicle. If you can provide us with photos of insignia, detailing, interiors, etc., we are also able to make personalized enhancements. And don’t forget photos of the underside of the vehicle! This is an important view when looking up at a weathervane. If actual scaled down models are available, we often find them helpful guides during the construction process. With our fully 3-D weathervanes, we usually offer our customers the option of Basic, Standard or Deluxe versions. With Basic 3-D designs, details are kept to a minimum. With Standard 3-D, more details are added to the exterior but the interior is left very basic. With Deluxe 3-D weathervanes, we also add full details to the interior, even though the interior is typically not visible when displayed on top of a roof. As a future collectible, interior detail is a sought after characteristic. 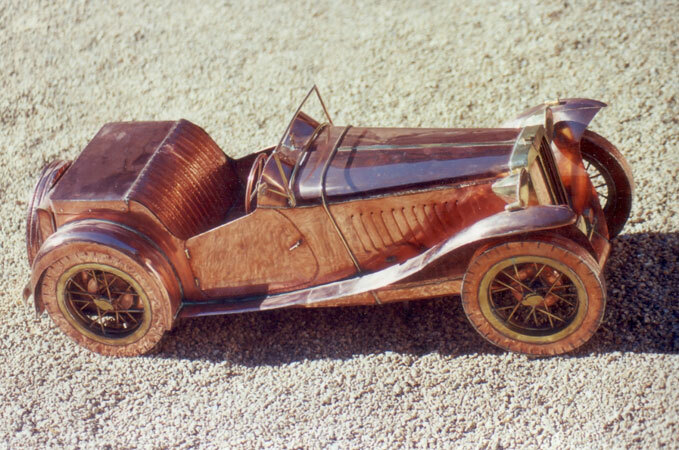 This MG was made as a Deluxe 3-D sculpture piece. Our customers often opt for Deluxe designs because they know that while the weathervane may spend 40 or 50 years displayed on the roof of a building, there is a good chance that some future generation may bring it down off the roof and display it indoors as an example of American Folk Art. If viewed in a museum, for example, all the interior details will then be visible.